FYI: While installing VS2017RC - Installing status hung at 65% AndroidNDK for over an hour, but eventually continued on - then again at 92% AndroidBuildSupport. I suspect the "Download Complete" bar lies and only counts downloading of install .exes and doesn't take into account any download those silent installers then have to do. Patience is key with any Visual Studio installer. Maybe start it before going to bed. Anyone else care to share what they're seeing, like, dislike with the new IDE? Biggest issue is that Xamarin isn't side by side with the RC and VS.net 2015 U3. Second biggest issue is that RC doesn't seem to support VS.net Android emulators which is pretty much a requirement for anyone doing mobile on Windows because they'll have hyperv installed which precludes using most of the Google Android vms. Hope there is a work around for this one, because the first issue is really a non-issue if this can get fixed. Really? Because I didn't have an issue with a few test projects this morning. I had made them in 2015, then opened in 2017, then re-ran in 2015 and all was good. They weren't complex. They were just basic new solutions as a starting point for testing. I don't use emulators so I can't speak to that. I develop against physical devices. Every Xamarin employee I talked to at Evolve 2016 made the same 'pinched face' any time someone would ask about issues when they were working against emulators and the first question they asked back is "Does it do that against a real device?". When the actual Xamarin development team react like that (over and over) to emulators I took it as a hint. Android phones and tablets are cheap and just part of the overhead cost of developing. I had the same poor install experience. I was unable to get anything to work, deleted my VM. I'm going to try again, this time, install components of VS one by one. Not a fan of this install experience at all. As I said there, I don't think the new "workloads" concept is working well yet. I don't think the definitions are right. For example of you tick "Xamarin" it doesn't really include everything you need. In the end I'll continue to do everything I've always done for years: Tick on EVERYTHING, start the install then go to bed, accept it will take 100gig on my boot SSD after all the droid emulator images and so on. That's just life. Don't try to trim it down, don't try to relocate things to another drive to save space. All that ever does is cause lots of aggravation to save 5-15gb. Just buy the biggest dam drive you can afford and install everything including the kitchen sink to the default locations. Then it works. Personally I think its about being too goal driven and taking the unit test mentality too far and into areas where that mentality doesn't belong. • Create the smallest possible acceptable criteria for good. • Now code just up to that test passing; and no more, no robustness, no 'what if', no fringe cases. The goals seem to have been to make the install as small and fast as possible. Well, you can achieve that if you don't install much. If the test criteria doesn't include "Can still open projects made with VS2013", "Can still make working apps for Android 5 & 6 as well 7" then your job is done. It doesn't work in the real world. But you reached your goal, got your bonus check and didn't fail any of the unit test acceptance criteria: But you did fail the customer. Absolutely ridiculous statement. Emulators have very good accuracy and in my experience it's 100%. They allow you to test so many combinations of OS, screensize, RAM, CPU, architecture with very little overhead compared to having to maintain a warehouse of physical devices. In 18 months I've yet to find a bug present in the emulator not present in the physical device or a bug in a physical device not replicated by an emulator. Yes I test release candidates on physical devices, but daily development is always against an emulator. I don't think its about accuracy @Matthew.4307 More about them being so darned slow. There are also several things you don't get with emulators... A real GPS that I can get NMEA from for one. A physical USB port that actually connects to a device for another. Not everyone needs that, but my app does. I don't worry about testing on tons of hardware combinations. I test against an older iPhone(small screen) with low specs and older Android tablet (big screen) with low specs. If my app runs acceptably and layout is good on 500mb of ram then it will run fine on 2gb. If it works with 5gig of drive space then it will work with 128gig of drive space. Etc. If it looks good across the gambit of small iPhone and large Android then I feel pretty good about it. After that, send it up to the test cloud to run on a couple hundred physical devices. I cannot seem to get VS 2017 with Xamarin to work at all -- I setup a clean Windows 10 Pro x64 VM, installed VS 2017 with Mobile development enabled and then tried to open an existing Xamarin solution. I was told that all projects were incompatible. I finally broke down and installed Xamarin (downloaded from the xamarin web site) -- the solution finally opened, now it says that it cannot compile as there are missing features. For a RC this feels WAY too unstable. VS2017RC does work with Xamarin. See the attached. Its nothing amazing, just the default "Welcome to Xamarin". It was started as a new solution from within VS2017rc. I made sure my system was fully up to date with VS2015, all its packages, all the Android stuff, Xamarin version etc. 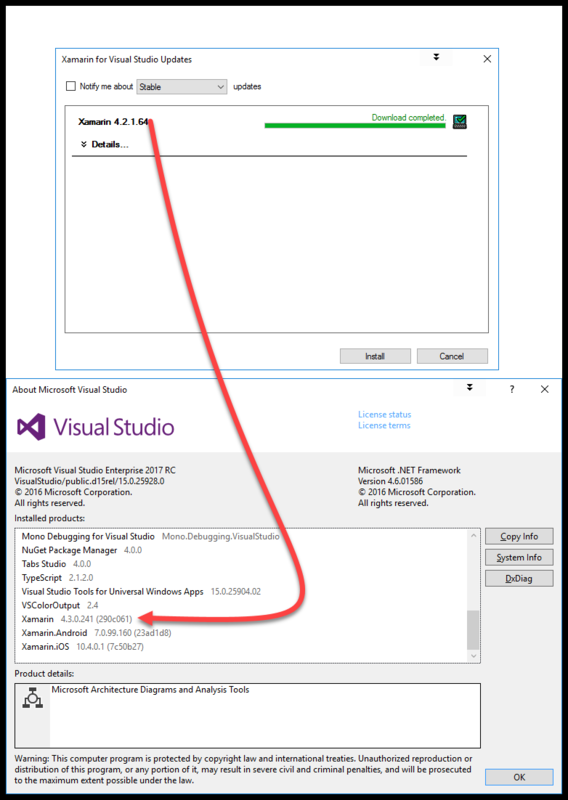 Then I installed VS2017 using the Xamarin & mobile workloads. NO JOY. I re-ran the VS2017 installer adding in all the optional stuff that experience says I need. Basically everything that isn't ASP and web development. I did NOT run the Xamarin installer. I trusted the included version. UPDATE: I just connected from home to office thru VPN, connected to our TFS2015 server, and successfully got the latest version of a branch I'm working on. So there seems to be some backwards compatibility there-BUT I won't fully vouch for it just yet. And they are doing their jobs well. Sadly XAML Regions and XAML Styler VSIX are not yet recognizing VS2017 as a target they can install in to. installed VS 2017 with Mobile development enabled and then tried to open an existing Xamarin solution. I've said it before and I'll repeat it here. I don't trust their new 'workloads' to be complete. I don't try to scrimp on 5gig here and there. Just check on everything. The whole big load for everything under the Sun. If its there, optional or not, get it. An extra 50gig of harddrive space doesn't amount to sqwat these days. Just consider it the overhead of being a developer. A half-terebtye SSD with 6gig buffer isn't but a hundred and fifty bucks, so upgrade if you need to. Again its the cost of tools for your profession just like everyone else has tool cost with their career. Same poor experience here. Even can't get connect dialog for build agent to open. Strange for a release candidate. Maybe i have another unstanding what word release mean. Things changing. Even can't get connect dialog for build agent to open. Well... I don't know what to tell ya to fix it. "Install everything" is the best advice I can give along with "Update everything", but I can tell it does work because I'm doing it. As I mentioned in this MacBook thread its working between my HP running VS2017rc and my MacBookPro. I had the same issues installing VS 2017 RC and now I'm having issues with the Xamarin update to 4.2.1.62. It requires Microsoft Build Tools 2015. I had to install it. The Xamarin setup wizard still doesn't have a Visual Studio 2017 option. There's one for Visual Studio 15 that is not checked. I checked it and installed. Once I opened Visual Studio 2017, all the Xamarin menus were gone! I meet exactly the same situation here. install over and over still the same. Don't update after you get xamarin work. it is very important. after i update . Xamarin disappeared again. @JensRatsey I have done that before, the same . 281 version i think. 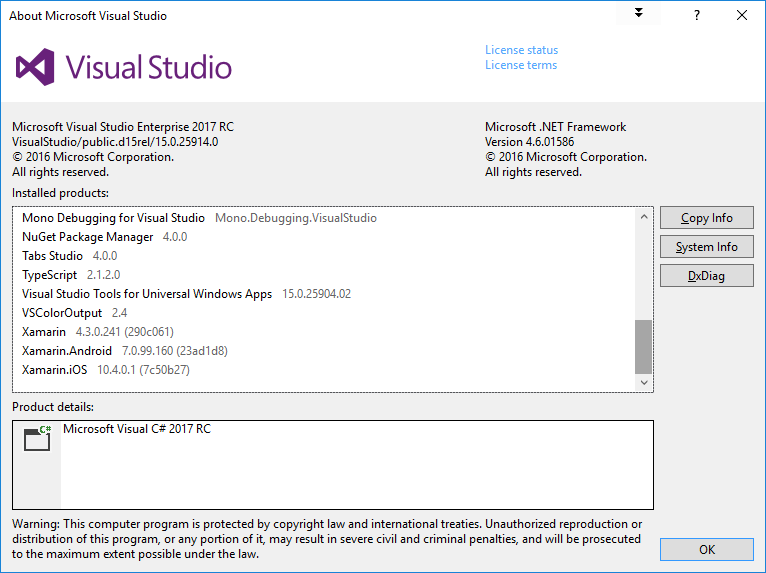 there is no vs2017 RC option. Is there anything new? I thought maybe something would have changed since the last time I tried VS 2017 RC and Xamarin over a month ago. Today (Dec 9), on a clean virtual machine, Windows 10, fresh install of VS 2017 RC, I can create a Xamarin app, but it cannot compile it. At a Xamarin/C# meet up last night, I was told to check out the Alpha channel under VS (Tool | Options -> go all the way down and find Xamarin/Other, then update using Alpha channel). The update starts with a pop up which does not offer VS 2017 on the update (all other VS are there). After updating, VS 2017 RC now no longer recognizes any Xamarin app, and the options for setting Xamarin in VS2017 RC are completely gone. Incidentally, I made a big mistake on installing VS 2017 RC on my regular developer machine. It somehow turned on Hyper-V, which is well known to be completely incompatible with Virtualbox (Vagrant, Genymotion, Xamarin Player (going away), etc.) When I ran Virtualbox, I got a BSOD and a system rollback of settings. Very horrible. VS 2017 RC is not ready what so ever. It shouldn't even be called a "Release Candidate." After the warning about not updating after things are working... Well, I had to try updating to 4.2.1.64. If it fails it fails; that just part of working with pre-release software and to be expected if it happens. But without experimenting and feedback nothing gets fixed. If a person won't be acceptant of pre-release software then they shouldn't install pre-release software expecting the stability of final release. I made a big mistake on installing VS 2017 RC on my regular developer machine. Yep - That is always a mistake for any piece of pre-release software and always has been - For decades. Ya just don't do that. That's what VMware virutal machines are for... Or that older secondary laptop from 5 years ago that doesn't have much purpose in life since it was replaced last year. You make a complete restorable image of the PC before you install. If things go to hell from the experimental software then you restore your backup. When installer launches, close 2017RC so it isn't open during the update. 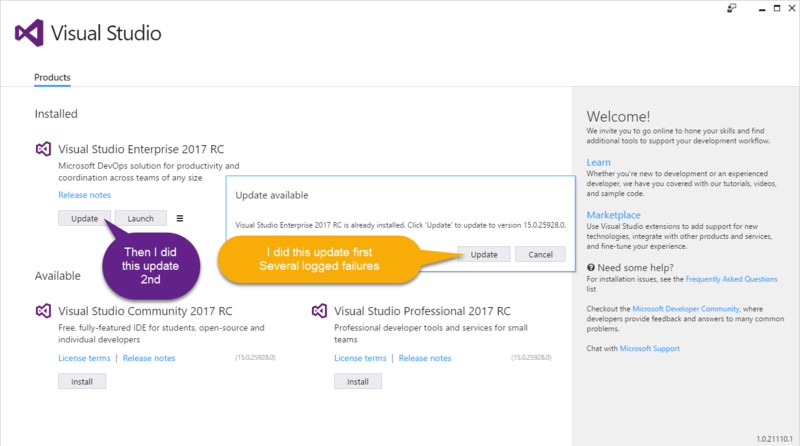 Interesting thing... From within VS2017RC it doesn't show any updates for itself; and the installer is the same version; yet when running the installer it reports "VS2017RC is already installed. Do you want to update to version 15.0.25928.0?" So maybe the installer finds new components or a new installer script on-line???? So of course I click [UPDATE]. At worst it gives me the previous Xamarin version, at best maybe its the latest. [3074:0025][2016-12-10T12:41:26] VSIX installer does not exist at 'C:\Program Files (x86)\Microsoft Visual Studio\2017\Enterprise\Common7\IDE\VSIXInstaller.exe'. [3074:0025][2016-12-10T12:41:29] VSIX installer does not exist at 'C:\Program Files (x86)\Microsoft Visual Studio\2017\Enterprise\Common7\IDE\VSIXInstaller.exe'. [3074:0025][2016-12-10T12:41:32] VSIX installer does not exist at 'C:\Program Files (x86)\Microsoft Visual Studio\2017\Enterprise\Common7\IDE\VSIXInstaller.exe'. [3074:0025][2016-12-10T12:41:35] VSIX installer does not exist at 'C:\Program Files (x86)\Microsoft Visual Studio\2017\Enterprise\Common7\IDE\VSIXInstaller.exe'. [3074:0025][2016-12-10T12:41:38] VSIX installer does not exist at 'C:\Program Files (x86)\Microsoft Visual Studio\2017\Enterprise\Common7\IDE\VSIXInstaller.exe'. [3074:0025][2016-12-10T12:42:06] VSIX installer does not exist at 'C:\Program Files (x86)\Microsoft Visual Studio\2017\Enterprise\Common7\IDE\VSIXInstaller.exe'. [3074:0025][2016-12-10T12:42:26] VSIX installer does not exist at 'C:\Program Files (x86)\Microsoft Visual Studio\2017\Enterprise\Common7\IDE\VSIXInstaller.exe'. [3074:0025][2016-12-10T12:42:33] VSIX installer does not exist at 'C:\Program Files (x86)\Microsoft Visual Studio\2017\Enterprise\Common7\IDE\VSIXInstaller.exe'. [3074:0025][2016-12-10T12:42:36] VSIX installer does not exist at 'C:\Program Files (x86)\Microsoft Visual Studio\2017\Enterprise\Common7\IDE\VSIXInstaller.exe'. [3074:0025][2016-12-10T12:43:14] VSIX installer does not exist at 'C:\Program Files (x86)\Microsoft Visual Studio\2017\Enterprise\Common7\IDE\VSIXInstaller.exe'. [3074:0025][2016-12-10T12:43:15] VSIX installer does not exist at 'C:\Program Files (x86)\Microsoft Visual Studio\2017\Enterprise\Common7\IDE\VSIXInstaller.exe'. [3074:0025][2016-12-10T12:43:16] VSIX installer does not exist at 'C:\Program Files (x86)\Microsoft Visual Studio\2017\Enterprise\Common7\IDE\VSIXInstaller.exe'. [3074:0025][2016-12-10T12:43:47] VSIX installer does not exist at 'C:\Program Files (x86)\Microsoft Visual Studio\2017\Enterprise\Common7\IDE\VSIXInstaller.exe'. [3074:0025][2016-12-10T12:43:48] VSIX installer does not exist at 'C:\Program Files (x86)\Microsoft Visual Studio\2017\Enterprise\Common7\IDE\VSIXInstaller.exe'. [3074:0025][2016-12-10T12:45:41] VSIX installer does not exist at 'C:\Program Files (x86)\Microsoft Visual Studio\2017\Enterprise\Common7\IDE\VSIXInstaller.exe'. [3074:0025][2016-12-10T12:45:51] VSIX installer does not exist at 'C:\Program Files (x86)\Microsoft Visual Studio\2017\Enterprise\Common7\IDE\VSIXInstaller.exe'. Despite confirming the VSIXInstaller.exe really is in that location. So that's a bug. Next I hit the [UPDATE] button on the main dialog, not the popup. It runs and I see it is installing Xamarin.Forms. Hurray! Try running VS2017RC - ReSharper throws a run-time error. Click [MODIFY] button in the hopes that it over-installs these components. 1308hrs - Looks like it is going to re-download all the parts again then re-install. Clearly this is going to be far more time-consuming that the last run because it seems to not be able to find any of the previously downloaded installer needs - Or maybe its getting newer versions??? No telling. I'm on satellite internet, so this will be slower than for those in the big city with 'real' broadband. Also going to consume a chunk of my monthly allotment of data. Something I think the folks at Microsoft don't consider for their consumers. 25 minutes later 12% complete. One could guess its going to take 200 minutes. 40 minutes later it jumps from 40% to done. Tools|Options - Xamarin is there. Still claims 4.2.1.64 is downloaded and ready to install. I think this might be the _real_ issue. We shouldn't be prompted to update to an OLDER version that isn't VS2017 aware. Which to be honest we all blindly believe the notice of a newer version without actually knowing the version installed - Me included as I just did and had to spend an hour undoing the damage. Nice to see the bug I filed through the VS2017RC built in bug reporting system was addressed. One always wonders if anyone pays attention to those things. Since they disabled the update in the current build it seems they do. Cool. but wait, just picked up on Reflection vs iOS... unless things have changed (which is true it seems every new day : ) that was a space of known limitations => quote "The System.Reflection.Emit is not available"
Any languages built on top of the Dynamic Language Runtime. Remoting's TransparentProxy or anything else that would cause the runtime to generate code dynamically. Important: Do not confuse Reflection.Emit with Reflection. Reflection.Emit is about generating code dynamically and have that code JITed and compiled to native code. Due to the limitations on the iPhone (no JIT compilation) this is not supported. But the entire Reflection API, including Type.GetType ("someClass"), listing methods, listing properties, fetching attributes and values works just fine. So the question then becomes: What added this dependency? The project in question is the "Welcome To Xamarin" solution right out of the box, plus about 4 styles defined on the app.xaml - There shouldn't be anything here that is a problem. I've had issues with every single Visual Studio installer with the exception of Visual Studio 2012 for Web. I had the most issues with 2015, particularly the Updates. Apart from taking forever, they never seem to work the first time. But at least it installed. VS 2017 RC won't even do that. It always hangs up on one of the Android items. Why???? Is a weird thing, but to get Visual Studio 2017 RC to work right I have had to "repair" the install 2-5 times before VS is actually happy that everything is in place. Before doing that had weird issues with many types of projects. 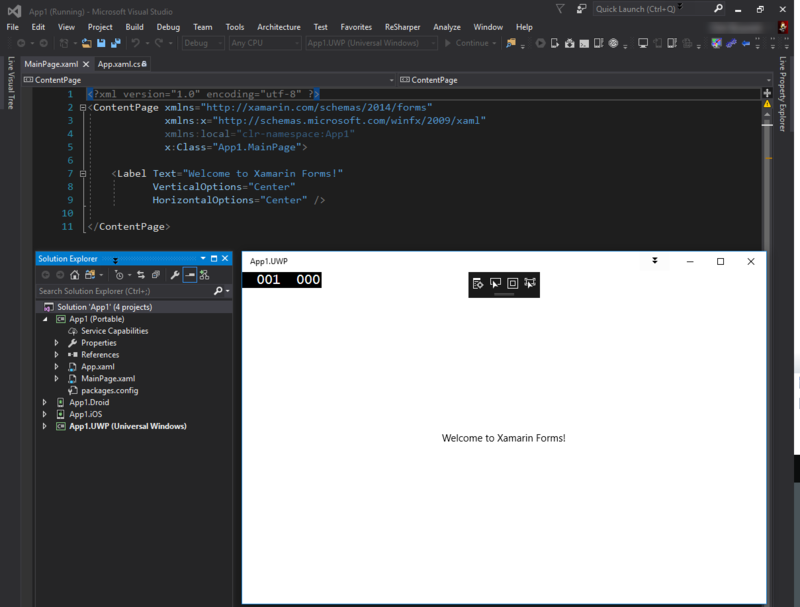 I dont know whats happening here,i am using xamarin together with vs2017 rc for my development......i get this wierd behaviour when i drag controls like text views and edit text on my designer,wire them up only to run and see nothing displaying on the app UI,......the layout is there and is wired in the main activity,no bugs but the UI just wont show when i run,it stays blank but shows on my designer and xml code is in order....what can cause this?? Huh? I don't think that was what he was talking about at all - me and my team are also trying to keep sane and get Xam.Forms working with VS-2017, and the first landmine was the emulator. As he said, it doesn't connect the manager, result is you can't see anything, and spend a good two hours trying to see what's going on. Eventually you find someone on some forum who says go look over there at some other reply, and the eventual answer is to go back to the VS installer and add a tick somewhere. Voila. This thread was created for the RC - Release Candidate. A number of fixes are in place now in the final release version. You might want to get the release and not the RC. If you are hitting issues in Visual Studio 2017, please create a new thread, as your issue is likely entirely different than one that folks were hitting in the RC. Thanks!